In this week’s Equities Spotlight, we shine the torch on well-known online employment business SEEK Limited. Seek (SEK) is Australia’s number one job advertising website, controlling almost 60% of the Australian and New Zeland online job-seeking market. Founded in Melbourne in 1997, Seek now employs around 400 people and has commercial stakes in the online job markets of China, South East Asia, Brazil, Mexico, New Zealand and the UK. Seek’s dominance in the Australian online job market is substantial, with a February 2010 study showing it had 126% more unique visitors to its website than the next competitor. According to Seek, the total time spent on its websites is more than 7 times its nearest competitor – an enviable statistic. Seek has two non-employment segments: Seek Commercial and Seek Learning. The Commercial segment allows users to browse for businesses and franchises for sale. The Learning segment markets, sells and distributes (predominately via online channels) vocational training and education training courses in Australia. Complimenting the Learning division is Think Group – a Seek-owned collection of Australian colleges providing vocational training and higher education courses. 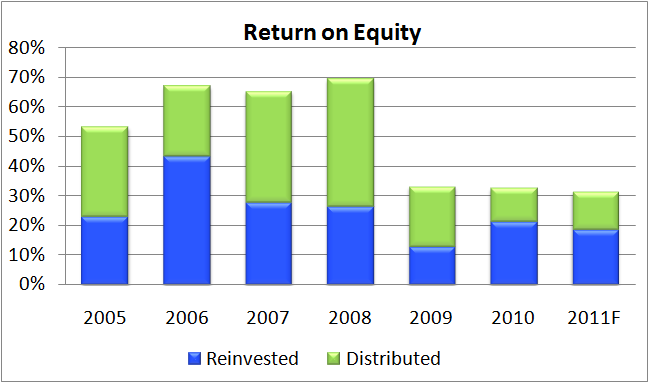 Seek’s return on equity (ROE) ranged between 50% and 70% leading up to 2008 – an impressive result, albeit an expected one for an online business that held relatively few physical assets. Since 2009, ROE has dropped to around 30%. This is due to a large capital raising in 2009, undertaken during the depths of the GFC in order to purchase the remaining 50% stake of Think Group as well as pay down debt. The days of +50% ROE appear to be behind Seek as it matures and grows its asset base through acquisitions and development of its Learning segment. 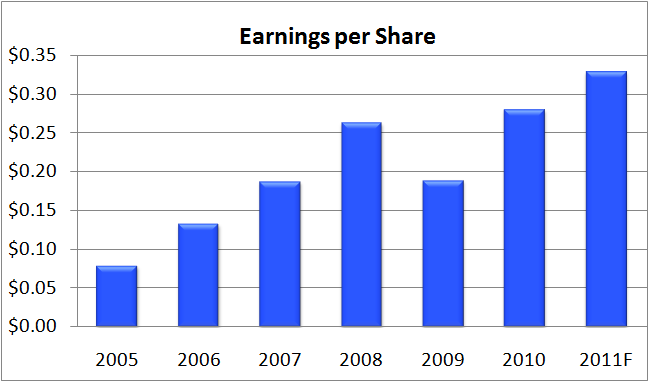 Earnings took a big hit in FY09 with NPAT dropping from $76m to $55m. This was due to a 10% drop in employment advertising revenues during the GFC. However, NPAT in FY10 bounced back to $90m and is forecasted to hit $110m for FY11. 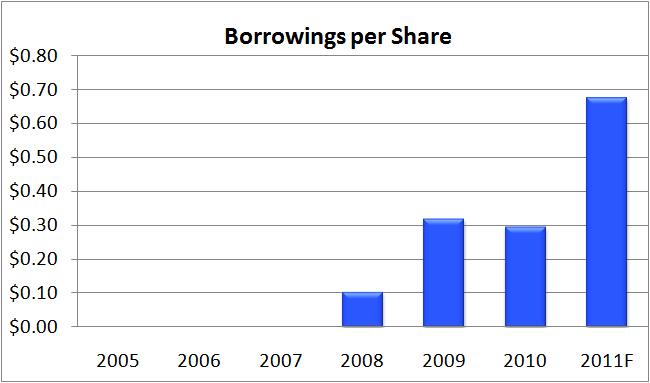 Once a debt-free company, Seek now has $0.68 borrowings per share. Debt more than doubled in FY11 to pay for the Seek Asia Ltd JV and a stake in Online Career Centre (Mexico). Despite this increase, debt is still relatively modest and can be covered by just over 2 years worth of NPAT. 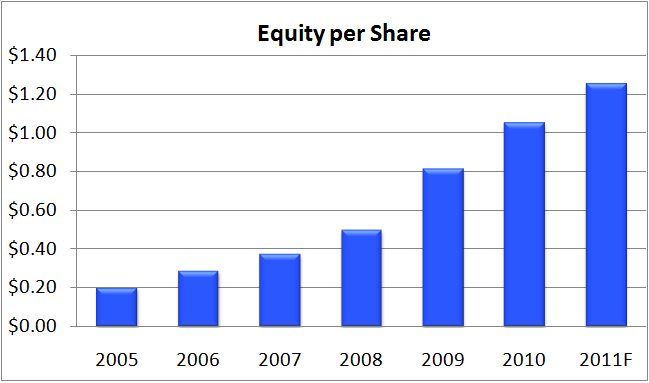 Equity per share has continually increased from $0.20 in 2005 to $1.25 in 2011 (forecasted). Earnings per share have increased from $0.08 to $0.33 over the same time frame, with the only decrease occurring during the GFC in 2009. Seek’s joint CEOs Paul and Andrew Bassat were both cofounders of the company and together own just over 5% of issued capital. They have steered Seek from a start-up online jobs business to a segment-dominating giant that is expanding its reach into foreign markets. Three of the four remaining directors have been with SEK for 6 years or more and have experience in education or the human resources industry. Of the six members, only two hold directorships outside of Seek – something we consider a positive as it encourages focus on Seek’s business. Board remuneration is mostly salary-based, with only the joint CEOs taking large share-based payments as part of their salary. This is not unexpected given the CEOs are also founders of Seek. Key management personnel have a mix of salary and cash bonus, with the cash typically making up less than one third of total remuneration. Interestingly, Seek will adopt a policy as of 1 July 2011 that requires all non-executive directors to acquire (over time) the equivalent of one year’s full pay in SEK shares. Presumably this is to encourage alignment of interests between Seek and all board members. Overall, Seek’s remuneration policies seem equitable and not overly-generous to upper management. Seek is an excellent Australian business that is dominating its home market and is now looking to expand into high-growth markets overseas. ROE has dropped in recent years to a very respectable 30% as the business matures and its home markets are saturated. Management have shown a knack for purchasing complimentary businesses that either add to Seek’s service profile or increase its geographic revenue base. Debt has increased in recent years to fund further acquisitions, however leverage is not excessive and the purchased businesses appear to be performing well. However, recent troubles with the foreign student industry in Australia and the high AUD may impact future earnings in the Learning segment. Seek has excellent ROE and an enviable financial position, but due to the low barriers to entry in online advertising we consider Seek a Very Good company. Should its market presence reach monopoly status in Australia, then it would be a serious contender for the “Wonderful” rating. Using an equity per share base of $1.25, an average normalised ROE of 35% over the next 5 years and an average reinvestment ratio of 38%, Empire values Seek at $7.70. Using a 20% discount to value, our maximum buy price for Seek is $6.40. Disclosure: The author is a Director of a private investment company (Empire Investing Pty Ltd), which has no current interest in the business mentioned in this article. The article is not to be taken as investment advice and the views expressed are opinions only. Readers should seek advice from someone who claims to be qualified before considering allocating capital in any investment. Great work again Q, although, I wish you’d stop letting the cat out of the bag on all these very-good/wonderful companies.. Thanks Dave, although lately share prices tend to do the opposite of our ratings so maybe we should be used as contrarian indicators by the short-termers! A lot of smart money has targeted this company as a short to play the AU housing collapse. This is because SEK is a cyclical business. If you believe unemployment is bottoming in Australia, you’re buying in at the top of the cycle. Furthermore in the event that unemployment does increase and the cycle turns on you, you probably get a big-time multiple compression. SEK’s share price is extremely sensitive to forecasts for unemployment, let alone unemployment itself. At the depths of the GFC it traded at $2.02, which was a huge oversell in my opinion and created a spectacular buying opportunity (one which I took advantage of). If unemployment increases and the market over-reacts in a similar manner, we’ll be buying at Empire. It will still be dominant player in the online employment market and when your investing time frames are truly long term (5 years plus) it would be a great contrarian buy. Although the share price has jumped 4% today. Go figure.